The past few months have seen a string of stories about major drug makers shutting down their neuroscience research, a move that seems to be the exact opposite of what they should be doing, even in times of economic distress. Many neurological disorders are the very definition of unmet needs, and one would think that pharma would pump in massive, long-term resources into Alzheimer's disease research with alacrity. But such are the times we live in. To reinvigorate the field and avoid repeating past problems, more exchange should be fostered between basic and clinical scientists. When spinal-cord researchers began organizing retreats and workshops to bring together basic researchers and clinicians, they saw first-hand how little each side knows about how the other works. The mutual lack of knowledge was huge; each side had completely different language to describe the same scenario. But this is exactly what the drug companies should have been doing, putting the basic and clinical scientists under one roof. It's lamentable that they need to have special retreats for bringing these folks together. The reason why this part jumped out at me was because I have just started reading Jon Gertner's great new book about Bell Labs. Many reasons contributed to the institution's phenomenal success, but one notable factor was the concentration of the purest and the most applied scientists under one roof. The firm's pioneering research director Mervin Kelly carefully planned the physical layout of the lab so that everyone, irrespective of specialty or research level, was a stone's throw from everyone else. That way even the purest mathematician was forced to interact and learn from the most hands-on engineer. Research and manufacturing were geographically indistinguishable. 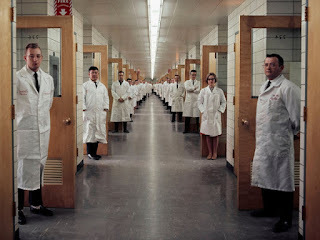 There was a very long seven-hundred foot corridor with open offices and labs on each side. It was impossible to walk down the hall and not learn something from someone working in a very different field. That formula still seems entirely relevant, especially when research has become highly complex and multidisciplinary, and it just seems relatively unproductive to hold special workshops and retreats so that the pure folks can talk to the applied folks. Sure, retreats and workshops can help, but as Bell demonstrated, there's nothing more productive than having the guy who wrote the book on spinal cord injury surgery just down the hall from the guy who wrote the book on dopamine antagonists. Startups and small companies can do this to some extent but they certainly don't have Big Pharma's resources. Big Pharma of course seems to have stopped listening. Image source (Update: As a commentator points out, the photo is not from Bell Labs but from Allied Chemicals. I can imagine the corridor at Bell looking quite similar though). It turns out that the picture is not of Bell Labs, as acknowledged in this New York Times correction. However, except for the posed researchers outside the doors, it is the same type of layout, and your basic point about the intermingling is spot on. Thanks for the correction, I have updated the post to reflect it.